Theodore's World: Rolling Thunder 2010 Memorial Weekend and Enemy Within Obama Will Not Be There ~ GOOD! Rolling Thunder 2010 Memorial Weekend and Enemy Within Obama Will Not Be There ~ GOOD! The roar of hundreds of thousands of motorcycles will fill the streets of our nation’s capital this weekend in tribute to military members who have paid the ultimate sacrifice to our country as prisoners of war (POW) or who have been reported missing in action (MIA) as Rolling Thunder 2010 gets underway in Washington, D.C. Started in 1987 by four Vietnam Veterans as “a demonstration to bring awareness to the plight of POWs and soldiers who are MIA,” the event has grown from its humble beginnings into a monumental patriotic tribute to soldiers and veterans from all wars that is appropriately held over Memorial Day weekend. Rolling Thunder First Amendment Demonstration Run Washington, DC. This annual run to bring awareness to the POW/MIA full accountability issue will take place on May 30th this year. The idea for Rolling Thunder was the brainstorm of Ray Manzo, Corporal USMC, who wanted to “host a motorcycle run in the nation's capital to show the country and the world that abandoned American soldiers in Vietnam still mattered to their fellow servicemen and the country for which they sacrificed their freedom.” Fellow veterans embraced his idea and helped turn the dream into reality, including retired Army Sergeant Major John Holland, head of the American Foundation for Accountability of POW/MIAs, Ted Sampley with Homecoming II Project at the Last Firebase vigil, retired Marine 1st Sergeant Walt Sides, president of the non-profit Warriors Inc,, and Bob Schmitt who had a POW family member. It is said that when Manzo discussed his idea of forming a motorcycle run to the group, Schmitt was staring in the direction of the Memorial Bridge while listening to Manzo's idea and blurted out, "It will be the sound of rolling thunder coming across that bridge.” The name has stuck since. The first Rolling Thunder was an exercise of the First Amendment "Right to Petition and Assemble" and consisted of approximately 2500 motorcycles who rode through the streets of Washington, D.C. “in an attempt to petition the government to take responsibility for the soldiers that were abandoned after the Vietnam War ended.” The ride has since grown to mammoth proportions, as hundreds of thousands yearly make the trek to D.C. to honor our servicemen and women and POWs and MIAs from all wars. Candlelight Vigil - 9:00 p.m.
Wreathlaying Ceremony – 10:00 a.m.
Saluting Our Troops - noon - 5:00 p.m.
Rolling Thunder will assemble at the Pentagon Parking Lot - 7:00 a.m. - Noon. Musical Tribute - 1:00 p.m.
Speaker Program - 1:30 p.m. The Stage is located at the Reflecting Pool across from the Lincoln Memorial. Maybe he doesn't like the sound of hundreds of thousands of motorcycle riding freedom-fighters roaring through the streets of D.C. all day and night for four days? Barack Obama is turning his back on the Vietnam veterans of Rolling Thunder who will gathering in Washington, D.C. this Memorial Day weekend for their 23rd annual demonstration to remind the nation of those servicemembers still missing or held as prisoners of war. In addition to skipping out on his duties at Arlington National Cemetery so he can vacation at the family mansion in Chicago, Obama will be cancelling what, under President George W. Bush, had become a traditional meeting at the White House between Rolling Thunder and the administration. Last year, after initially rebuffing the veterans group, the Obama administration invited Rolling Thunder at the last minute for a low-key meeting that Obama dropped in on. Even though Obama toyed with them, Rolling Thunder released a gracious statement praising Obama and his wife for their attention given to veterans and military families. This year, according to Jennifer Harper's Inside the Beltway column at the Washington Times, the Obama White House has frozen out Rolling Thunder completely. No meeting with staffers, no sit down with Vice President Joe Biden who is remaining in Washington, no nothing. I wonder if Obama will pal around this weekend with his Chicago neighbor and friend Bill Ayers, the terrorist whose group, the Weather Underground, plotted to murder soldiers at Fort Dix with a massive nail bomb during the Vietnam War. Obama is a classless, arrogant,Marxist Muslim homosexual poser who deserves impeachment and a trial for treason. Yes I know the good news is he won't be there, I agree with that too. I was torn when I first heard about his snub to Arlington, because I want the Office of the President to be there. 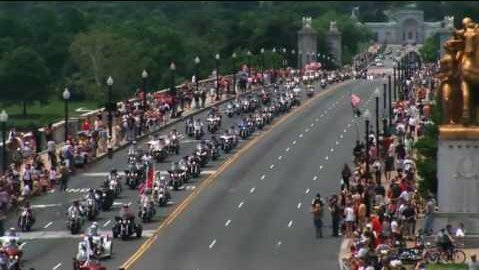 But thinking more about it, it would be a travesty for Obama to come anywhere near Arlington, or to attend Rolling Thunder. He is the enemy within, period! He is a communist fascist and our Memorials are to those who fought and died fighting communism and fascism. Trevor Drown is a friend of mine and is there this weekend and has been doing updates at his Facebook page. You might like to friend him there as well. Trevoe served as a Green Beret in Afghanistan. While in the Special Forces he saw firsthand what happens in countries without democracy. Personally I'd prefer obama not show up. He does not respect this country nor does he respect what our Soldiers have done for the past 235 years. He has no emotional attachment to this country and to allow him to place the Wreath on the Tombs of the Unknown would be a disgrace. As far as I am concerned he doesn't belong there. These National cemeteries are hallowed ground and honored this day only by an appreciative country with reverence and respect. My cousin is there now too. I agree exactly with what Mark said. He has no business with those who've sacrificed for this nation. Mark is right, and so is Chrissie. Obama has no understanding or respect for this event, and neither do his radical fans. They have no place there. the man has to go!!! I rode in this morning from Gaithersburg, together with more than 1000 other bikes. The number of bikes was much bigger than last years; it took forever to get down to the Pentagon. I'm convinced that our president has something to do with this. And yes, I'm glad Obooboo was not available. I'd feel dirty! I see these veterans and I think: as long as we have these veterans, the moslims will never take over this country! No, the POTUS was not with the Tomb of the Unknown crowd in DC. So far this weekend, he's been visiting Screwy Lewie Farrakahn and being protected by some of his buddy moosies. Mark, I agree, after I thought it over from my initial reaction and read what you and the others said I saw it is so much better this way. I agree completely about his being anywhere near any of this on this special weekend and day tomorrow. BobF., thank you for sharing that. How wonderful that he is there. Rhod, that is the thing too, he does not understand not even a little. Gator, she is right. Thanks for sharing that. Eddy, beautifully said. Thank you Eddy. Billy Ray, yes he did not want to be there, he could take a vacation anytime and he did this on purpose. I am glad he will not be around Arlington or with the Rolling Thunder, he is evil and has no place there. Thank ou so much for the mention. It was an incredible and emotional weekend. I was honored to be one of the speakers and the outpouring of fellowship and brotherhood was inspiring. There are only three combat veterans running for US Senate in this election cycle. I am one of them. I hope to be able to go to DC in January and bring the POW/MIA and Veterans issues to the forefront where it belongs.